Endodontists are specialists who undergo post-graduate training to deal specifically with this area of dentistry. They are also trained to expose, diagnose and treat causes of complex orofacial pain. To understand endodontic therapy, it helps to understand the general anatomy of the tooth. The outermost layer is a highly mineralized structure called enamel. The layer underneath the enamel is less mineralized and is called dentin. The pulp is located at the center of the tooth. The pulp contains a combination of blood vessels, nerves, and connective tissue that work together to support the overlying structures. 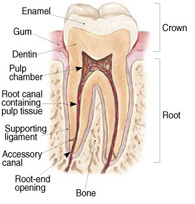 The pulp extends from the root tip to the crown portion of the tooth, and is essential for proper development. Once a tooth has matured, typically 2 to 3 years after normal eruption into the oral cavity, the pulp is no longer required for proper function. The tooth continues to receive nutrients from the tissues that surround it.